Bluewater now services ALL Hot Tub makes and models! Call our knowledgeable service department today, to book a Service call and order parts for your tub. Our technicians are not only the best at servicing our own Bluewater hot tubs, they have the knowledge and training to service other makes and models as well. Our trained technicians have years of experience in the industry and understand what it takes to get the job done efficiently and effectively. Leave the work to us so you can relax and enjoy your Hot Tub for years to come. Service calls on ALL makes and models (including our own)! We sell replacement tub parts, heaters and pumps. Time to visit us to buy a new tub? Not to worry – we’ll remove the old one for you! 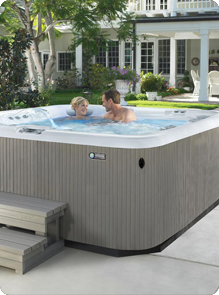 If you have any additional questions or concerns, click here to read our “Hot Tub Troubleshooting” guide for help and tips. Please complete below form to be contacted regarding Hot Tub Service.